I read the Percy and the Olympians series by Rick Riordan last year and fell in love with Percy and his crew. 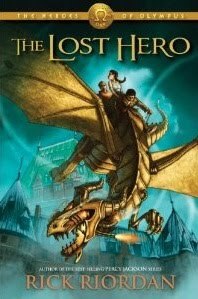 The Lost Hero is the first book in The Heroes of Olympus series and a continuation of the those adventures. However, in addition to the already established characters and Greek mythology-based world, Riordan introduces new heroes and villains, quests, a new prophecy, a looming battle and adds Roman mythology to the mix. Mr. Riordan begins this new adventure by introducing his central characters, Jason, Piper and Leo as they're on a field trip away from the Wilderness School for incorrigible teenagers and on their way to the Grand Canyon. Immediately we know there's something wrong when Jason wakes up in the back of the school bus and doesn't remember who he is or where he came from. He doesn't even recognize his girlfriend Piper or Leo, his best friend. As our three friends work on essays or admire the views, strange weather turns violent and soon Jason, Piper and Leo find themselves under attack from dark forces or venti. Their teacher Coach Hedge comes to their defence saving their lives. After a quick and messy battle where Coach Hedge is lost, the three are rescued by Annabeth and taken to Camp Half-Blood for safety where they learn who and what they are. While at camp, Piper and Leo are claimed by their respective god (parents) and mysteriously, Jason finds he has already been claimed and by whom. After a series of on-camp adventures, visions and prophecies, the three are sent on a quest to save the (not-so-likable) goddess Herra who has been imprisoned by an unknown evil. A month earlier Zeus closed off Olympus and no one has heard from the gods, so the three friends must succeed without help from the gods or even Annabeth who is off to find a lost Percy! The adventure begins and our heroes will meet cyclops, wind gods, giants, werewolves and more as they prove their loyalty and bravery to themselves and each other along the way. Since the Lost Heroes is a continuation to a series, there's no worldbuilding to set up and secondary characters have already been developed, so the readers can get right into the story. However, Riordan does add newness to the worldbuilding by incorporating Roman mythology and weaving it with the Greek mythology introduced in the Percy series, giving this book a fresh feel. Although Riordan stuck with three heroes and the same formula: two boys and a girl, the characters themselves also felt different and unique. Jason is brave, a true hero and his powers are strong. But they are already developed even if he doesn't remember exactly how or where he learned them. He is also confused, depressed and leery for most of the story, something that sets him apart from the other two, even when he's there for them. He's still a bit of a mystery by the end. Piper is distraught for much of the story and suffers from self-esteem issues due to what she perceives as her father's neglect or lack of love. She has to make some tough choices and that sets the tone for her character development. In Piper, Riordan gives us an ethnic heroine -- she's half Native American and her background and some of those myths are used in the story. Piper is not super duper smart, but she's strong and she knows how to use her powers of persuasion. I enjoyed her character growth from beginning to end. Leo is undeniably my favorite character and provided those 'aww moments.' He lost his mother as a young boy in a horrific 'accident.' But although he also suffers from guilt and loss, as opposed to his two friends, Leo knows what it is to be loved and his way of coping is through his sense of humor, mechanical know-how and loyalty. I loved his ingenuity and bravery. The story is divided by chapter with the titles Jason, Piper and Leo, but written from the third person point of view making this an easy read. Internal dialogues abound with most of the revelations happening in dream sequences and then related to others, slowing down the pace and isolating the characters in some sections. At times, the dialogue is somewhat stilted and lacks flow. And although the humor is provided mainly by Leo's character, there's not enough of a give and take from Jason and Piper to really make it pop. Real action is slow to come, although once on their way our heroes encounter plenty of obstacles throughout their adventures. I enjoyed The Lost Hero, it had plenty of strengths and some weaknesses. 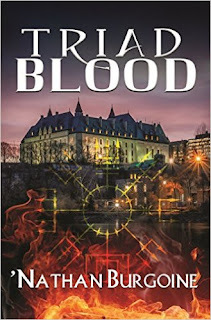 It was a quick and easy read with great action and new adventures. I loved the new twists and turns that Riordan added to the Olympus series by incorporating Roman mythology and look forward to the rest of the series. Plus there's definitely a bit of a cliffhanger there at the end, and I must know! The protagonists in this book are teens, but these books are appropriate for (and I believe will be fully enjoyed by) middle schoolers. I do recommend that the Percy and the Olympians series be read first for a better understanding of the world and characters. Christine, that's interesting! I was so excited to read this book because I loved the Percy books so much. But I know a lot of people are worried that they won't like them as much. Well, I don't think they have to worry. It's not Percy, but it's the same world and the characters are all there too, sooo... yeah, maybe you can get her to read it. :) It's good! I haven't read any of these books, but I'm planning (hoping) to watch the movie at some point...I can't believe I just wrote that! Glad you enjoyed it, Hils :) I pretty much agree with you on everything :) I like Jason and like you, my favorite is Leo. I have to say, I wasn't that fond of Piper. She got on my nerves at times. This one sounds good, too. KMont, I hope you enjoy The Lightning Thief. I loved that series as a whole. This is a good beginning to the sequel and a great adventure, but I think the 3rd person POV takes away from it. I loved the 1st person POV in the Percy books... much more effective.